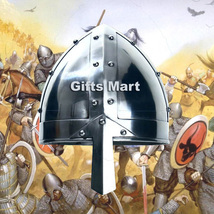 Product reviews for "Gifts Mart Helmet"
Great reproduction of an English Civil War Helmet. The ridge at the crown, which many repro helmets do not provide, is true to the English style lobster tail helm of the ECW. The ear pieces, although not the smaller standard triangle shaped pieces, are attractive and provide more protection to the side of the head. Since there were many variations of this helm it doesn't seem to matter and certainly does not detract from the presentation. 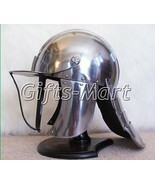 I also feel that the overall dimensions of this helmet is more uniform than some of the more expensive ones. Overall, very good craftsmanship and quality. EXCELLENT VALUE FOR THE PRICE.